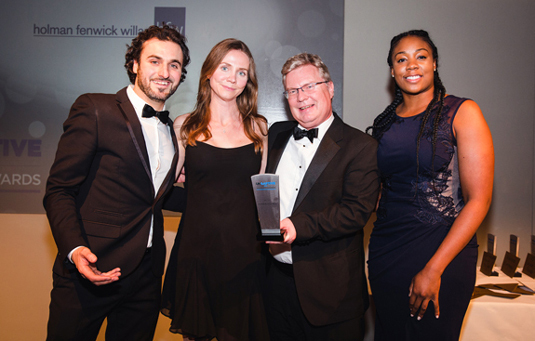 For the second year in a row, and the third time in the past four years, HFW has won Law firm of the Year 2017 at UK Captive Services Awards. The Onshore Law Firm of the Year UK Captive Services award was collected by Insurance Partner Jonathan Bruce and Insurance Senior Associate Alison Proctor at last week's awards ceremony held at Plaisterers' Hall, London. This is the second year in a row HFW has collected this accolade, and the third time within the last four years that the awards have been running. In 2014 this was the first non shipping award that the firm had won. The 2017 award confirms HFW's leading role in an important part of the insurance sector namely the 5000 captive insurers owned and operated by major corporations around the world. The submission represented work done by both the corporate advisory and claims specialists within the Insurance and Reinsurance group in London, Dubai , Melbourne and Sao Paulo. This work consisted of advice in respect of establishment, sale, taxation, redomiciliation, run off, insurance and reinsurance contracts and complex cross border high value insurance and reinsurance claims and recoveries. For further information please contact: Paul Wordley, London Partner on +44 (0)20 7264 8438 or email paul.wordley@hfw.com, or Richard Jowett, Melbourne Partner on +61 (0) 3 8601 4521 or email richard.jowett@hfw.com.